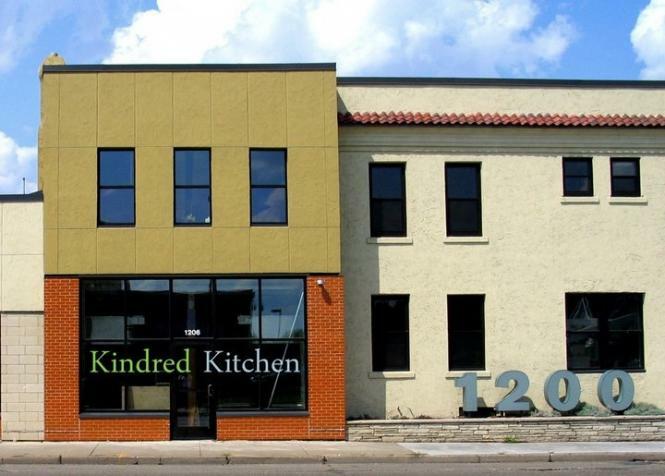 You may not have heard of Kindred Kitchen, on West Broadway in North Minneapolis, but if you keep up with food in the Twin Cities, chances are you've heard of, and perhaps even enjoyed, food prepared by some of Kindred Kitchen's chefs. Sweet Jules caramels were recently featured in Minnesota Monthly's Food Lover's Guide to the Twin Cities. Food trucks Vellee Deli, Simply Steve's and Natedogs have been written up at sites like Heavy Table and the food blog of Minneapolis St. Paul magazine. City Pages blog, hot dish, also published a great interview about the Vellee Deli that will make your mouth water. How are these vastly different food ventures connected? These businesses and many more have been supported and helped to launch by Kindred Kitchen, a licensed commercial kitchen as well as a food-business incubator. The incubator aspect sounded vaguely Orwellian to me until I visited. As kitchen and program manager Terese Hill showed me around, I quickly saw how relevant and timely their service is. Kindred Kitchen launched last fall with a large, licensed, industrial kitchen available to rent for groups who didn't have their own cooking space. 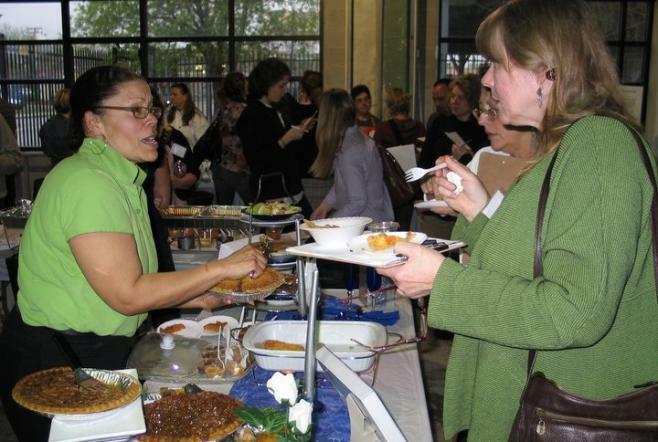 Alongside the rental kitchen, the food-business incubator program offered a variety of seminars, workshops and more to help aspiring local entrepreneurs take the next step(s) in their food businesses. The dual kitchen/incubator plan is modeled on that of La Cocina, a successful San Francisco program designed to support low-income entrepreneurs in the food market, which has many high barriers to entry. Different people have different products, and are at different points in bringing their business to the public. Some want to open a restaurant or a food truck, others want to sell their products at farmers markets or local grocery stores and co-ops. Participants may need to refine their product, define their target market, plan for things like labor costs, or set up a business plan to get financing. Some need to determine nutrition facts, packaging and expiration dates. The incubator programs at Kindred Kitchen help target and clarify what comes next. Over their first fall and winter, the Kindred Kitchen team saw a bigger need for support in the early stages of the business learning curve, especially in areas like licensing, insurance, and food safety. For many, renting kitchen space was something in the future, once they got a food business up and running. Now Hill and her small team spend a large part of their time scheduling, staffing, and enrolling for the 14-week workshops. Workshops take place in the spring and fall; the next one starts September 1. As part of the mission to support and strengthen the neighborhood, scholarships are available to residents of North Minneapolis. The most recent class finished in May with a food showcase by the students, who presented their ideas to about fifty potential buyers. Heavy Table recently interviewed a few of the graduates. The shift in focus from the kitchen to the incubator programs happened largely because the kitchen now has an anchor tenant. Occupancy and usage are more predictable, yet still allow for other rentals. The kitchen itself is full of stainless steel appliances; tenants provide their own food, tools and accessories. There is storage on site for dry food as well as frozen items. The new anchor tenant is Sisinni Food Services, owners of Mainstreet Bakery and Backstreet Kitchen. They are converting an unused space in the building and hope to open Sidestreet Cafe this fall, serving food, wine and beer. Kindred Kitchen is owned by Catalyst Community Partners, a neighborhood development company. Their mission is to build and sustain better living in challenged neighborhoods like North Minneapolis. The 1200 West Broadway building is a good example of what they do; over the years it's been a mortuary, an auto garage, and a daycare. It stood vacant for many years before Catalyst took over the space. The remodel turned the 1200 side into offices and the other side into Kindred Kitchen. As part of its ongoing growth, Kindred Kitchen is converting a conference room to a food-prep room and is moving the workshops and seminars to a large, windowed space in the neighborhood owned by Cookie Cart, a non-profit organization teaching local youth job and leadership skills. On Thursday August 4, Kindred Kitchen is holding a Food Truck Taste-a-Thon with food, local beers and prizes. Later in August there will be free exploratory workshops for those interested in learning about the program or different aspects and types of food businesses. More than ever, given spring's tornado destruction, Kindred Kitchen wants to be part of the revitalization of North Minneapolis by providing jobs and stimulating business with a new generation of food providers. Not even open a year, they're off to a promising start. Kristin Boldon is a frequent contributor for Simple Good and Tasty, who also writes for the Eastside Food Cooperative's newsletter on health and wellness, Minnesota Monthly's food blog Dara & Co., and her own blog Girl Detective. Her last post for us was "Cooking from Heidi Swanson's 'Super Natural Every Day'."